I am writing to you from Next Media Animation, the media company known for producing animated videos about Tiger Woods, Steven Slater from Jet Blue, and, recently, the TSA body scanners and our "feud" with Conan O'Brien. Although we enjoy doing fun and quirky animations, today we have produced a serious news animation that is near and dear to our hearts. Chinese dissident Liu Xiaobo will be awarded the Nobel Peace Prize on Friday, however, instead of traveling to Oslo to receive the award, Mr. Liu will be spending the day in jail. He is serving 11 years on charges of “inciting subversion of state power” for his part in the writing of Charter ’08, a document that called for greater freedom of expression, human rights and free elections in China. 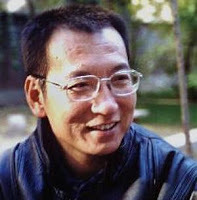 We at Next Media Animation maintain a strong democratic voice in Taiwan and Hong Kong in defiance of such oppression in our region of the world, and would appreciate your help in making Liu Xiaobo's story of courage more well known. On behalf of all of us here at NMA and Mr. Liu, I would appreciate it if you could post this video to your site." Why not. For anyone interested in a translation of the incendiary Charter '08 Manifesto that landed Mr. Liu in jail for eleven years, the complete document is published at Foreign Policy Magzine. 2. Separation of Powers and Checks and Balances: Construct a modern government that separates powers and maintains checks and balances among them, that guarantees the separation of legislative, judicial, and executive powers. Establish the principle of statutory administration and responsible government to prevent excessive expansion of executive power; government should be responsible to taxpayers; establish the system of separation of powers and checks and balances between the central and local governments; the central power must be clearly defined and mandated by the Constitution, and the localities must exercise full autonomy. 4. Judicial Independence: The judiciary should transcend partisanship, be free from any interference, exercise judicial independence, and guarantee judicial fairness; it should establish a constitutional court and a system to investigate violations of the Constitution, and uphold the authority of the Constitution. Abolish as soon as possible the Party’s Committees of Political and Legislative Affairs at all levels that seriously endanger the country’s rule of law. Prevent private use of public instruments. [MORE]"
We can't do much to help Mr. Liu, but we can at least help distribute the words that are the reason he is incarcerated today. This also serves as a good reminder of the true nature of the autocratic leadership in the People's Republic of China.